Time to get in the wayback machine for a trip down science/nature travel memory lane. 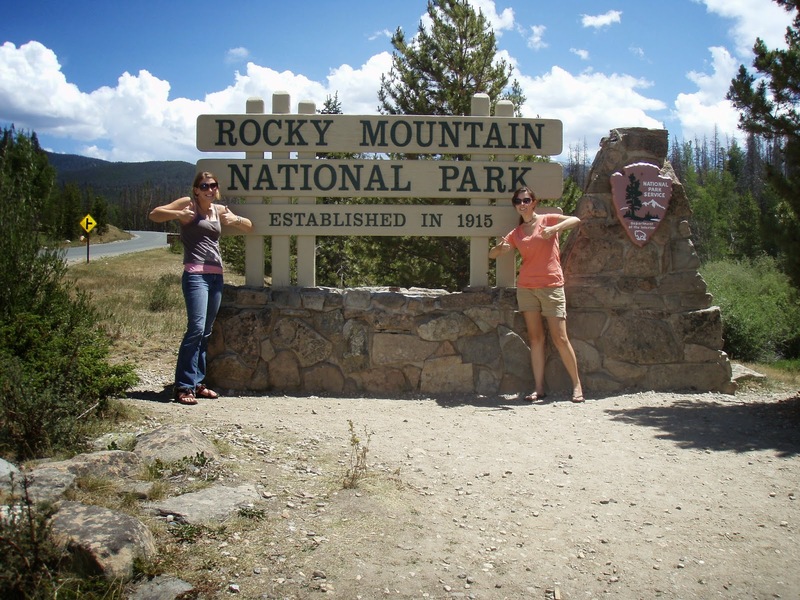 In the summer of 2012, just after I had finished my MS degree and just before I was slated to move on (and up the coast) to start my PhD, Meridith and I planned and executed the Amazing Besties National Parks Road Trip! Meridith was tantalizingly close to completing her MS degree as well, so it totally counted as a double celebratory trip! Our goal was to see as many national parks as possible, with an eye to balancing quality and quantity, and road trip our way from Las Cruces, New Mexico (Mer’s former hood), up to Portland, OR for the Ecological Society of America conference, then scoot back down the California coast to Long Beach, where I would pack my stuff into a truck and move! If you’re new to this series of blog posts, I highly recommend you check out the summaries of the early stages of our trip, which were originally posted on Meridith’s former blog and later migrated to our current one. Clickity-click for: the take-off, Carlsbad Caverns National Park (days one and two), ABQ New Mexico, on the road, Zion National Park (day one and two), me getting us really lost, Arches National Park, a babal about invasive species, and Rocky Mountain National Park day one! About 95% certain this is a portion of Bear Lake from above. When last we left our Amazing Besties National Park Road Trip, we had just finished our first full day in Rocky Mountain National Park. We had taken an awesome hike up Deer Mountain, seen 18 big horned sheep, and I had beaten Meridith in a friendly game of pool. We didn’t let all this fun keep us up too late though. We had big plans for the next day, July 20, 2012. Pretty sure this is Meridith “being a critter” in the montane ecosystem. We got up early, as per the instructions of the friendly park ranger we spoke with on the previous day. 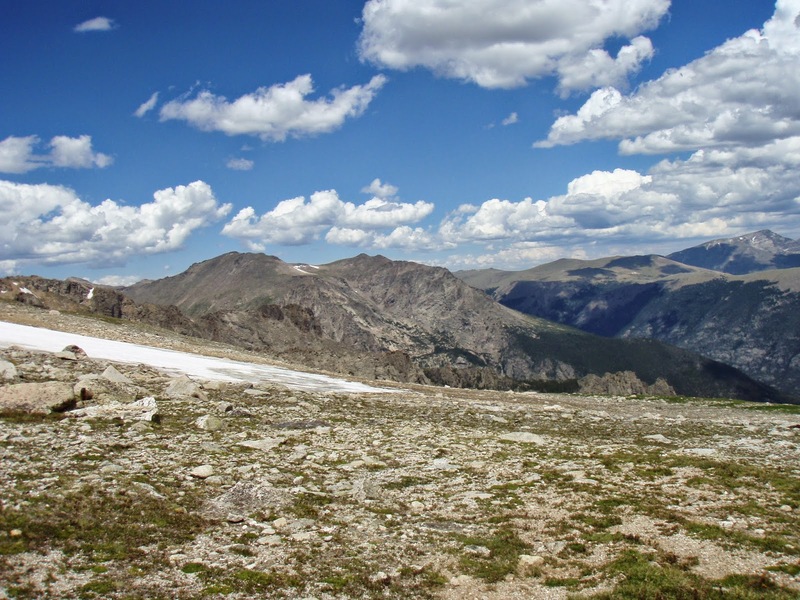 We were planning to hike the Flattop Mountain Trail, which peaked in altitude at 12,324 ft! The ranger had warned us afternoon thunderstorms were common in the region, so we wanted to get an early start and avoid getting caught in the weather on an exposed mountain. Plus, Bear Lake Road (the road to the trail head) would be closing after 9am, necessitating a shuttle trip if we didn’t get up and get going. The many benefits of getting friendly with the park rangers! I love having the inside scoop. We were rewarded for our early start with a sparsely populated Bear Lake area, which is one of the most popular spots in the park. After a stop to apply sunscreen (easy to get sunburned at high altitude!) and fill up our hydration bladders, we found the Flattop Mountain trailhead and began our ascent. 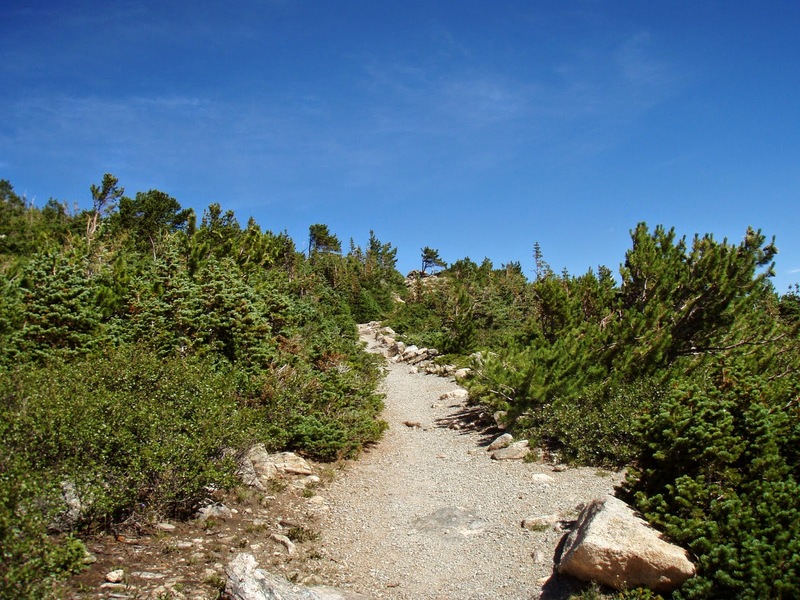 The park ranger had suggested this trail based on our desire to get a bit of a physical challenge (8.9 miles roundtrip and almost 3000 feet of elevation gain) and see all three high altitude ecosystems the park had to offer. We are the nerdiest of nerds. 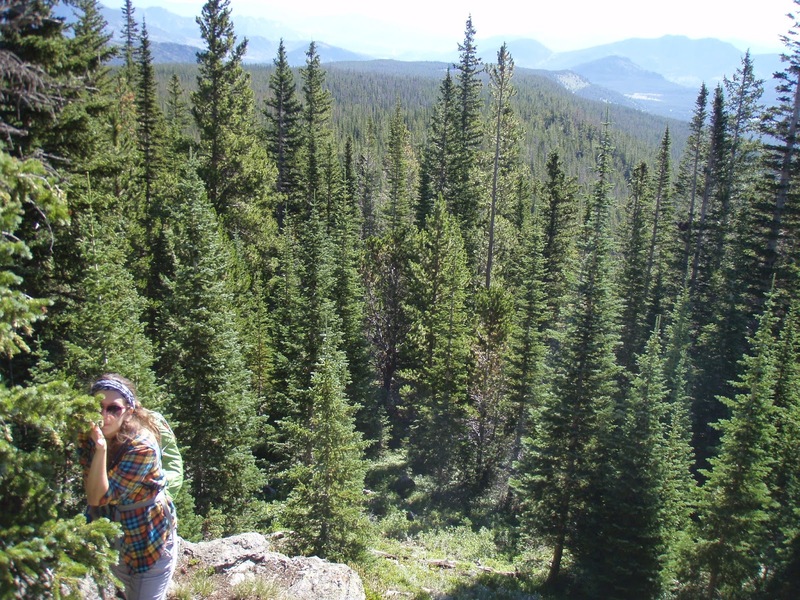 We started off in the montane ecosystem, much like what we had hiked through the day before on Deer Mountain. 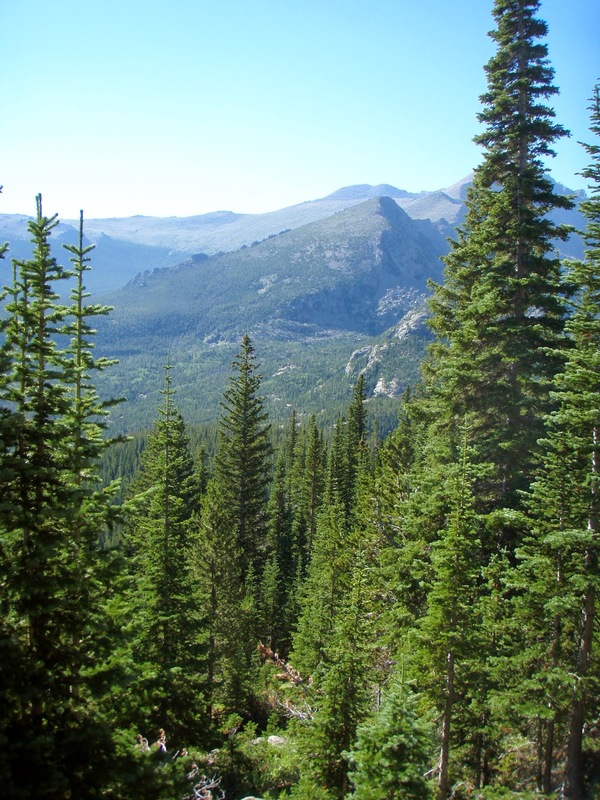 According to the park’s website, montane ecosystems occur between 5,600 and 9,500 feet. We saw many of the characteristic pines of this ecosystem. We were also treated to some lovely lupins (Lupinus), Indian piantbrush (Castilleja), as well as some other pretty wildflowers whose faces don’t have a name in my mind. One of my favorite parts of climbing up is looking back down at the same landmark over and over again. Watching Bear Lake get smaller and smaller as it peeked from between trees made the first mile or so go very quickly. Subalpine Ecosystem, everything look so intense! That is a huge cairn, which we though was hysterical. 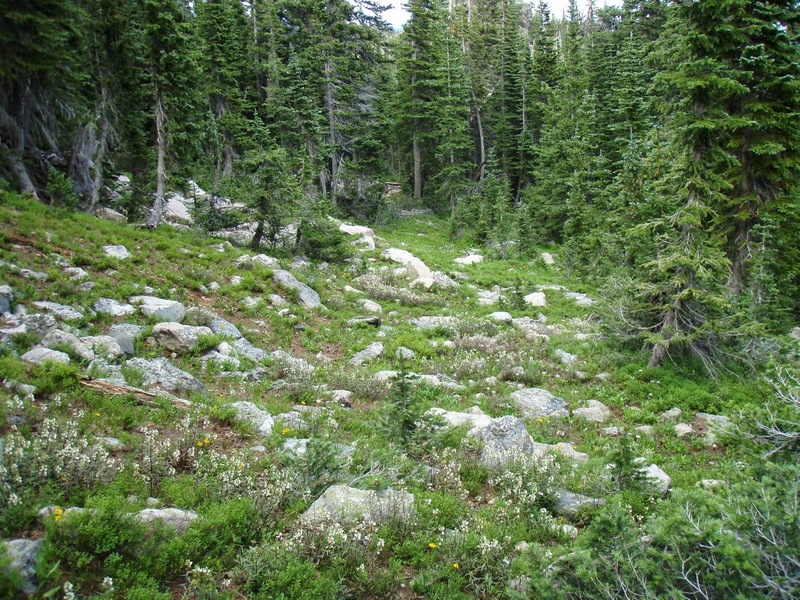 As we moved up into the subalpine ecosystem, spanning the range from 9,000 to 11,000 ft in elevation, the vegetation began to change. Short, gnarled subalpine spruce and Engelmann fir dominated the landscape, but a few pines persisted. Most of the larger trees we spied had the tops snapped off, making them look a little naked. We hypothesized (like you do) that snow was the likely culprit. I remember being in Africa and thinking I could tell, just by the character of the plant life, that this was a hard place to live. I felt the same way about the tough looking scrub trees along the trail. Way to stick with it, guys! At this point in the hike, the types of animals we saw also started to change. We saw our first yellow-bellied marmot! These guys are essentially just fatty squirrels. It’s funny, because the noises we made upon catching our first glimpse were very similar to the noises he made while checking us out from his rock. Appreciative squeaks all around! Mt. top naps for the win. Finally, our hike brought us into a true alpine tundra ecosystem. I think I might have been annoying Meridith a little bit with the phrase, “I totally have a crush on this ecosystem.” I totally do! It’s just so fascinating. 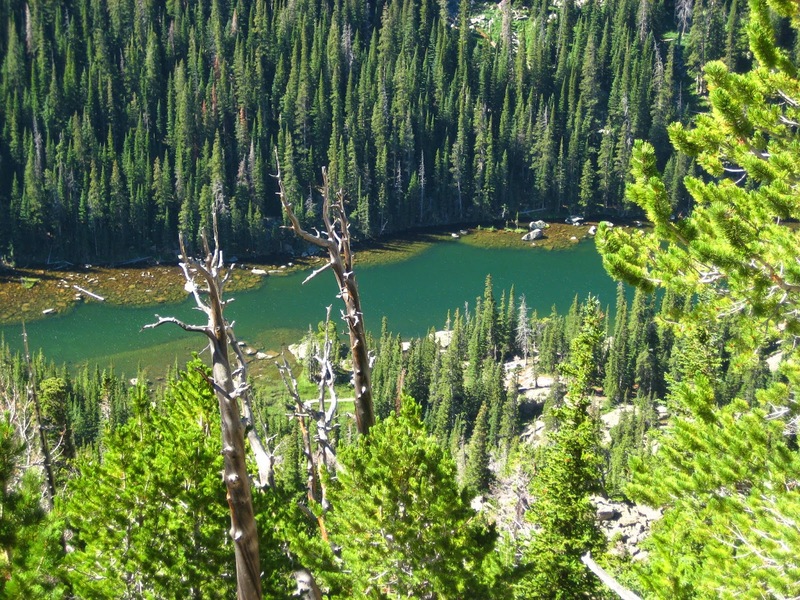 This ecosystem begins around 11,000 or 11,500 ft in elevation, past the point where trees can grow. Due to the exposure, liquid water is a major limiting resource, meaning tundra is basically a type of desert ecosystem. 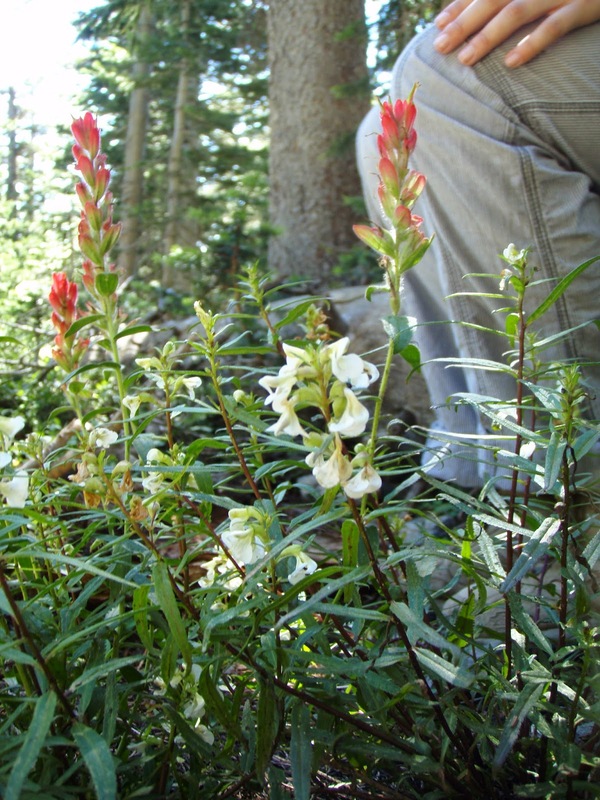 I was instantly squatting down, peaking at plants, and pointing out adaptations I thought were similar to those we had seen at Zion and Arches National Parks. Suddenly, we heard the most precious of little sqees. A pika! This adorable alpine guinea pig pretty well made my day. Due to my love affair with the tundra, it took me a little while to notice that Meridith had flagged down and boarded the Struggle Bus. 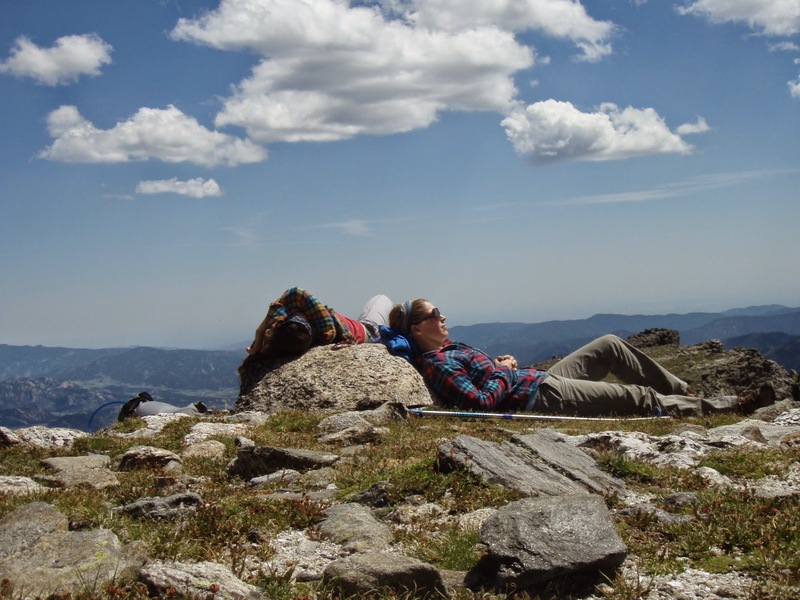 The impacts hiking at high altitude have on a person are, in my experience, not correlated at all with physical fitness. In retrospect, Meridith likely had a touch of altitude sickness. Pro tip for those prone to such things, a preemptive Advil or some such thing can help you make it! Being the total trooper that she is, Meridith made it to the top of Flattop Mountain (and so did I)! We both oohh-ed and awww-ed at the view for about 2.5 seconds before taking an epic mountain top nap. Highly recommended. When we awoke, we were both feeling grand. We ate a spot of lunch, then poked around the mountain top, enjoying our accomplishment, before heading back down the way we had come. (Editor’s note: This is about the time I decided to aggressively drop my camera for the umpteenth time, dislodging some vital wiring innards, essentially rendering the back screen useless. However, it still managed to arrive alive at the end of our journey!) 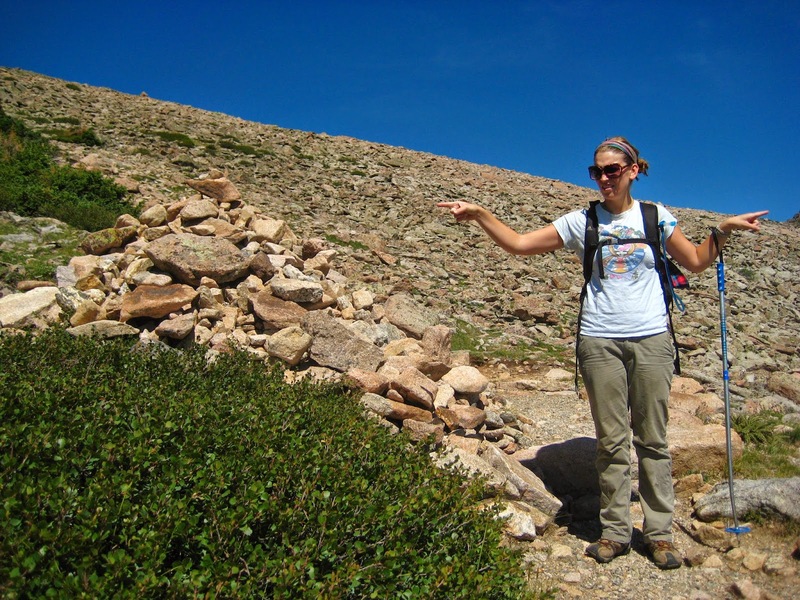 See Meridith’s previous post about the proper way to descend on a hike. you missed on the way up! We were feeling really good about ourselves at this point, and super excited about the play day we had set-up with one of our friends from the previous night. We shared food and chatted around the campfire well into the evening. He convinced us to take Myers Briggs Personality test and, as fate would have it, Meridith and I have super compatible personality types. The descriptions pretty much said, “You guys should be best friends and take lots of adventures together.” Noted Myers Briggs. Eventually, we had to break-up the party and head to bed. The next day, we were hitting the road again, this time for Yellowstone National Park!